Move FAST to secure this modern and relaxed four bedroom plus study home in sought after Kearneys Spring. 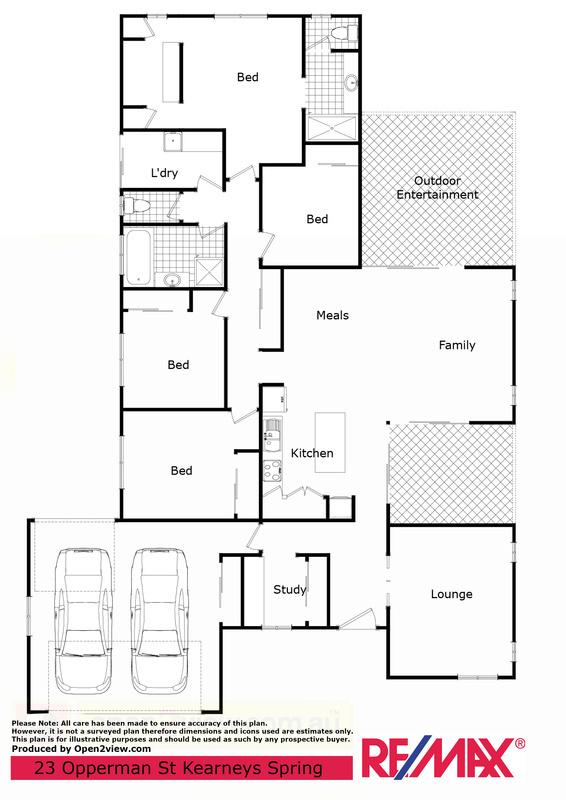 It has a clever floor plan that flows seamlessly between indoors and outdoors. Built by Arden Vale Homes, this sleek and chic abode is situated within easy walking distance to the University of Southern Queensland and boasts quality fixtures and finishes throughout. This beautiful home has four great sized bedrooms. The master has an ensuite with double shower, separate toilet, ceiling fan and massive walk-thru robe. There is also a separate study. The dining/living areas are open plan with ceramic tiled floors and air-conditioned. The cool neutral tones flow seamlessly through to the outdoor entertaining areas. The chic kitchen has stainless steel modern appliances as well as stone benchtops, dishwasher, drawer bin and LOTS & LOTS of storage. There are two outdoor entertaining areas, one just off the kitchen for and easy view of the kids as well as another off the main living area..
With so much to offer and an owner who is MORE THAN REALISTIC this will be sold in a heartbeat so move fast!